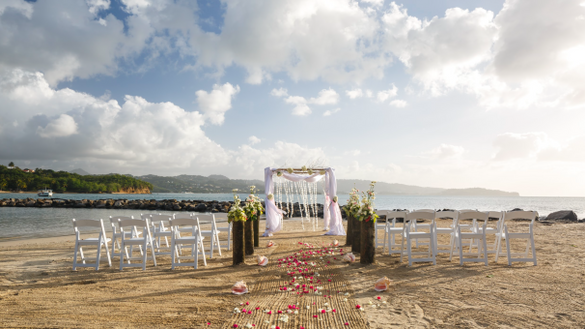 LABRELOTTE BAY, Saint Lucia (April 2018) – Designed to take the guesswork out of destination wedding planning, the Say Yes, Before I Do package at Windjammer Landing Villa Beach Resort, Saint Lucia allows couples the opportunity to get a preview of their wedding day at a huge savings. For only $900.00, couples will enjoy an all-inclusive, three-night stay at the resort to fully embrace all that it has to offer before booking their fairy tale wedding. Windjammer Landing’s Say Yes, Before I Do package also includes meeting their complimentary on-site wedding planner, a complete property tour to scout the backdrop for their picture-perfect ceremony; a meeting with the resort’s chef alongside a cake tasting to determine the ideal menu and decadent dessert; plus a spa credit of $200 which can be used toward a couple’s massage or other spa treatment during their visit. “The Say Yes, Before I Do package allows the future bride and groom to experience the resort and its amenities first-hand, to interact with the friendly and accommodating staff, and to visualize the ceremony and celebration of their dreams without any pressure or exorbitant expense,” notes Melanie Reynold, wedding specialist at Windjammer Landing. The Say Yes, Before I Do package is $900 per couple in a Premium Ocean View room for three nights travel between April 13 and December 20, 2018, and is $1500 for travel during peak season dates. Both are subject to 10% VAT and 10% service charge. During their stay at Windjammer Landing, included are all meals and beverages at five resort restaurants, and four bars; the luxury of six swimming pools; a 24-hour fitness center; water sports, such as waterskiing, snorkeling, kayaking and tube rides; complimentary resort wide Wi-Fi; Manager’s Cocktail Party every Tuesday; and the conveniences of a mini-mart and gift shops. For more information or to make a reservation, contact Weddings at (877) 308-9001 or visit www.windjammer-landing.com. For couples that choose this resort for their wedding, they will be center stage, as the resort’s policy is to have only one wedding per day. This ensures the resort team’s attention will be focused on the couple. Windjammer Landing offers a completely customizable Tropical Bliss wedding package which includes a dedicated wedding planner and a team of wedding specialists; a decorated setting and civil ceremony; tropical bridal bouquet; tropical boutonniere for the groom; a chilled bottle of champagne; and transfers to and from the lawyer’s office to process forms, the marriage license, certificate and registrar fees. A la Carte options include a photographer, a videographer, entertainment and hair and makeup services, to name a few. Couples can select from one of three venues: Barefoot on the Beach, Gazebo By the Sea or the Hilltop Garden, all overlooking the beautiful Caribbean Sea. For more information about getting married at Windjammer Landing or to begin planning your celebration of love in paradise, contact a Windjammer Landing Wedding Specialist at weddings@windjammer-landing.com. Situated on one of the largest, crescent-shaped, white sand beaches on the island, Windjammer Landing Villa Beach Resort is a unique resort offering over 195 hillside and beachside accommodations consisting of 1 to 5 bedroom villas where all guests enjoy the stunning views of the Caribbean Sea. Many of the villas also feature their own private residential-size or plunge pool. Resembling a Mediterranean-style village, the resort is draped along 60 acres of Saint Lucia’s northwest coast in Labrelotte Bay. Windjammer Landing offers a unique Caribbean and romantic setting for a wedding and honeymoon couple and everything a couple needs to create a memorable experience that is uniquely Windjammer Landing. As a testament to the resort’s reputation, Windjammer Landing has earned the TripAdvisor® Certificate of Excellence award for seven consecutive years. For more information or to make reservations, call (877) 522-0722 from the U.S. or Canada. Find Windjammer Landing on Facebook, Instagram and at www.windjammer-landing.com.